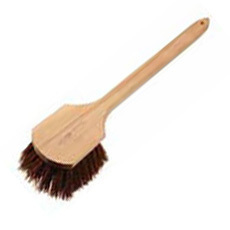 Felton Brushes manufactures a wide array of brushes to cover all of our customers’ needs. 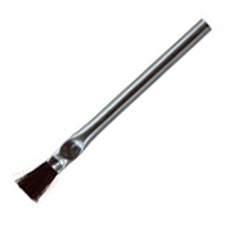 Usually what makes each brush so different from the next is what the filament is made of. Felton makes brushes out of metal wire as well as synthetic and natural materials, often using the fibres listed below. 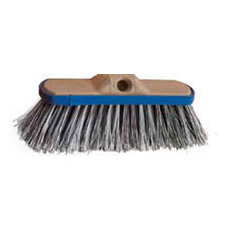 However, if your job requires something extra, you can talk to us about our custom brush offerings. Carbon steel wire is available in a variety of different sizes, diameters, and shapes and is a widely used metal fill material. 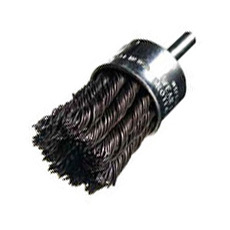 With its excellent cutting ability and strong fatigue resistance, steel wire brushes have a very long life at economical cost. 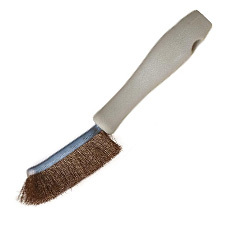 Used for general purpose cleaning, rust removal, deburring, edge blending, and roughening. A highly corrosion-resistant material, stainless steel wire is used where contamination or rust can create harmful ferrous deposits on brushed parts. 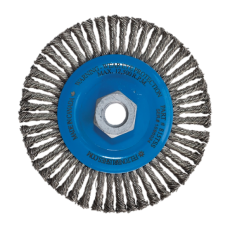 Suitable for use on other stainless steel or aluminum products, or in conditions where the brush in use would be subject to moisture or high-humidity on a repeated basis, stainless steel has very unique uses. The softest metal fibre available, brass is used for light to medium cleaning and luster finishing. Brass offers a brushing acting that will not scratch harder metals, and will not create sparks when struck against other metallic surfaces, making it suitable for hazardous work environments. Brass is also an excellent conductor of electricity and is useful in static reduction applications. Brass is relatively corrosion-resistant. Bronze wire is harder and stiffer than brass due to the addition of tin to the copper, yet retains the conducive ability and does not produce sparks when striking other metallic surfaces. 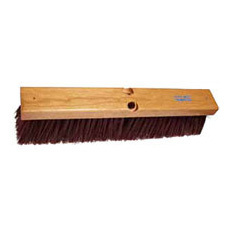 Suitable for cleaning metal parts and leaving the base material intact. Bronze is relatively corrosion-resistant. 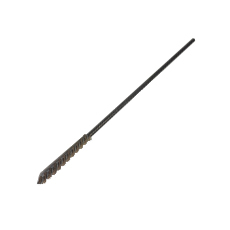 A polymer filament with low specific gravity, high temperature and acid resistance is a the most versatile brush fibre available. 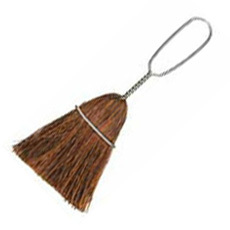 Polypropylene exhibits outstanding durability and is useful in nearly any sweeping application. An abrasive filament, made of nylon impregnated by silicon carbide grit. Known for its durability and widely used in many industrial applications, it is preferred for finishing ferrous metals. 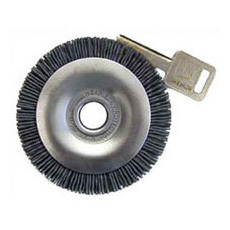 There is less filament breakage and longer brush life when using silicon carbide fill, than typical wire brushes. Nylon offers excellent bend recovery, abrasion resistance, flex fatigue resistance and chemical resistance. All nylons absorb water in wet conditions, which will reduce their stiffness, sometimes by up to 80%. There are different grades of nylon for different purposes. Although nylon has excellent resistance to hydrocarbons, oils, alkalis and cleaning solutions, it is attacked by oxidizing agents, acids and aromatic alcohols. A tough material perfect for abrasive applications. The aggressiveness of the filament coupled with a prolonged brush life, and stability to heat/chemicals make it a perfect choice for heave duty applications that require a superior finish. Popular filament in the automotive industry, and various deburring applications. The most aggressive grit, it fractures easily to create sharp edges. 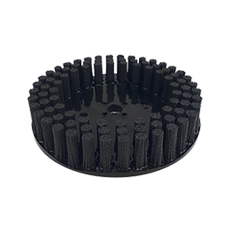 Highly used in a variety of abrasive applications such as deburring, polishing or sanding, our ceramic grit features an even grit distribution, grit load and diameter control. Known for its aggressiveness and long-lasting lifespan. 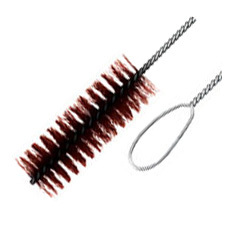 Made from the hair of the tail or mane of a horse, the tail hair being stiffer, Horsehair has a soft, but stiff texture, giving it scratch-free cleaning abilities and excellent durability. 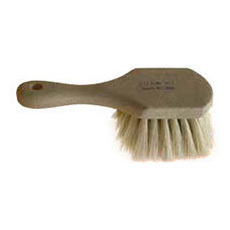 Used in buffing, cleaning and dusting, this fibre can come in many different colours. Soft, resilient and long lasting, horse hair is a premium fibre. Not resistant to acids or alkalis. High heat resistance. Made from the Agave Lechuguilla, a plant unique to Mexico with tough, rigid and very sharp leaves. Naturally creamy white in colour, the fibre is often dyed, and has a rough texture, yet fine, soft qualities. 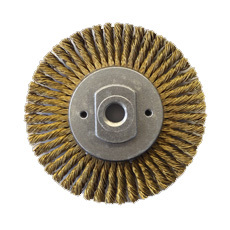 A highly versatile fibre, it is well-suited to polishing or buffing applications. High water absorption and retention abilities. Resistant to heat, most chemicals, alkaline and acidic solutions. Excellent anti-static properties. Made from the Borassus Flabelliformis, a palm native to southern Asia, from the base of the leaf stalks on the tree. The term Palmyra refers to a medum-coarse fibre, while Bassine refers to stiff, coarse fibres that can only be used when damp. Palmyra is known for its durability and long-lasting qualities. High water absorption. Resistant to heat, most chemicals, alkaline and acidic solutions. Naturally dark brown in colour, Palmyra can be dyed and is often oiled to make the manufacturing process easier. A blend of Tampico and Palmyra fibres that creates a strong, durable fill with amazing water absorption and retention abilities. Union Fiber have gained its popularity and widespread use through their remarkable resistance properties and long-lasting lifespan.